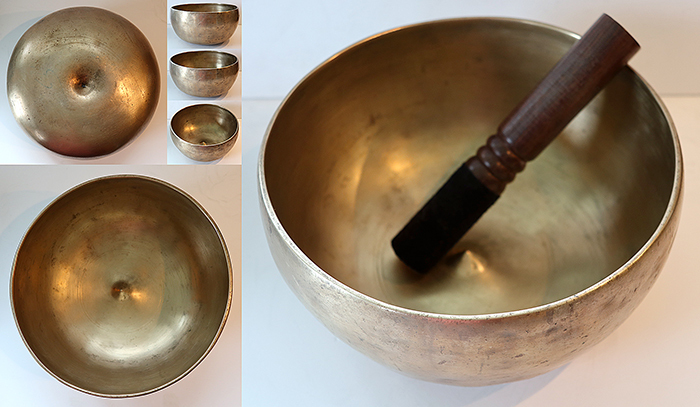 This is an unusually large Antique Lingam Singing Bowl with a perfect pitch low third octave Eb fundamental (156Hz) when struck with a padded mallet or played around the rim with a suede ringer. The rim note changes to a middle Bb harmonic (458Hz) with a wooden ringer. This bowl has been expertly forged and has very fine walls and a sheered lip. There is a neat pointed lingam at its centre surrounded and defined by concentric circles, and a nice matching navel or yoni underneath. This is an old bowl, and such decorative features that it might once have possessed have been largely worn away with long use over time, although there is some evidence of ritual gashes around the outer rim. This lovely old bowl is in excellent structural condition, clean, and free of stains and blemishes, and has an attractive bright golden bronze colour.